Let’s face it: traveling through Europe can be quite an expensive endeavor. And if you’re like me, there’s always an infinite amount of places to visit, an infinite amount of food to eat, but definitely not an infinite amount of money to make it all work. The last thing you want to do is spend your vacation eating McDonald’s everyday, which is what one German couch-surfer did while staying at my D.C. group house few years ago (I think he may have been a McD super-fan though, as he seemed pretty happy about it). Don’t get me wrong, I definitely have my McDonald’s cravings once in a while, but anyway, I think a gourmet picnic is an excellent compromise. Granted this works best with nice weather, the idea is basically to go to a fresh Italian market, pick up food that doesn’t need (much) preparation, and go somewhere incredible to eat it. 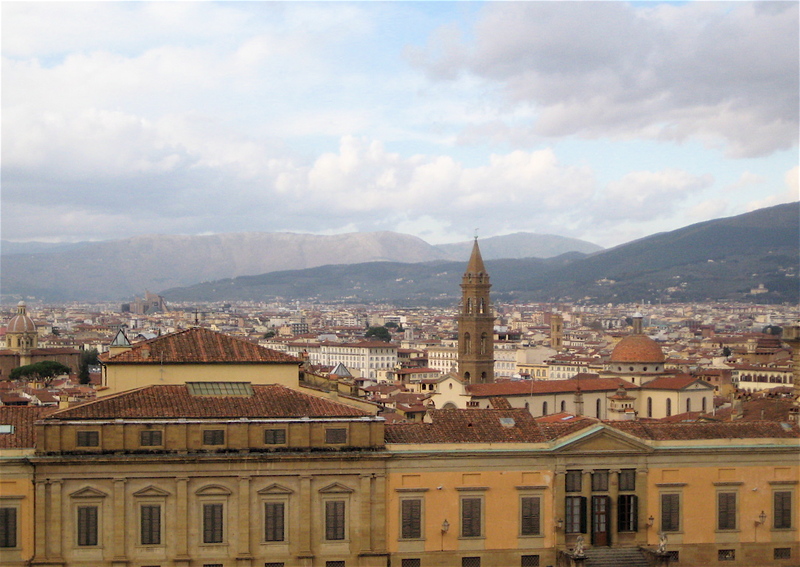 I was in Florence a little while back with my eating buddy, B, and we made up a great system for traveling together: spend the majority of our money on food, and the rest of our funds on select historical sites and museums. We went to the famous San Lorenzo Mercato Centrale food market in Florence and were overwhelmed with fantastic lunch options. There were plenty of locals grabbing a bite to eat at their usual food stalls, chewing slowly and watching the chaos of indecisive tourists circling the market several times, or struggling to articulate what it is they wanted to the loud and abrupt Italian waitstaff, who were just trying to get through the lunchtime rush. My friend B and I were among those who circled the market over and over, trying to investigate all the unique merchandise (cow face, anyone?) until we realized that we were starving and that it was decision time. 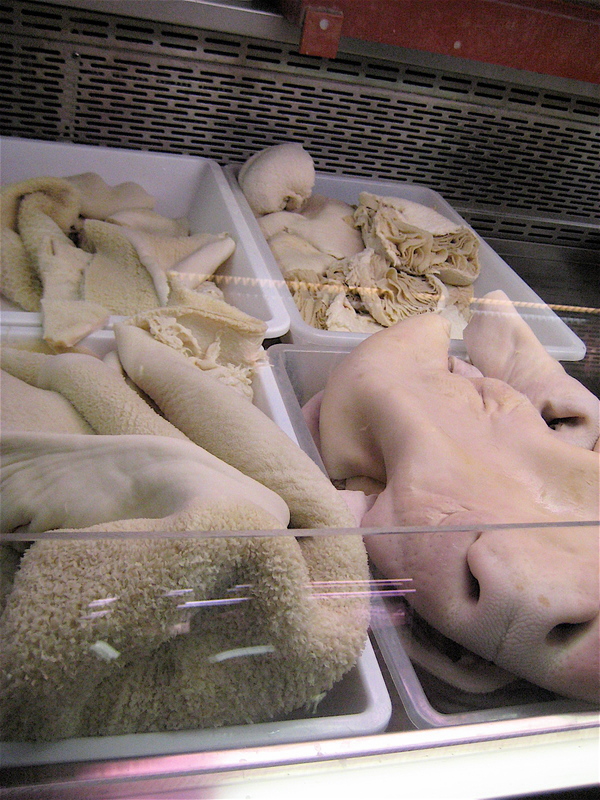 There was a section in the market just for prepared foods. First thought: we should probably eat some vegetables. After my previous discussion about contorni (healthy side dishes that usually include vegetables) and how I usually opt for something new and delicious-sounding that has carbs or cheese in it, my eating buddy and I decided to look for the healthy stuff. I got a nice mix of roasted peppers, carrots, eggplant, and zucchini (yum! 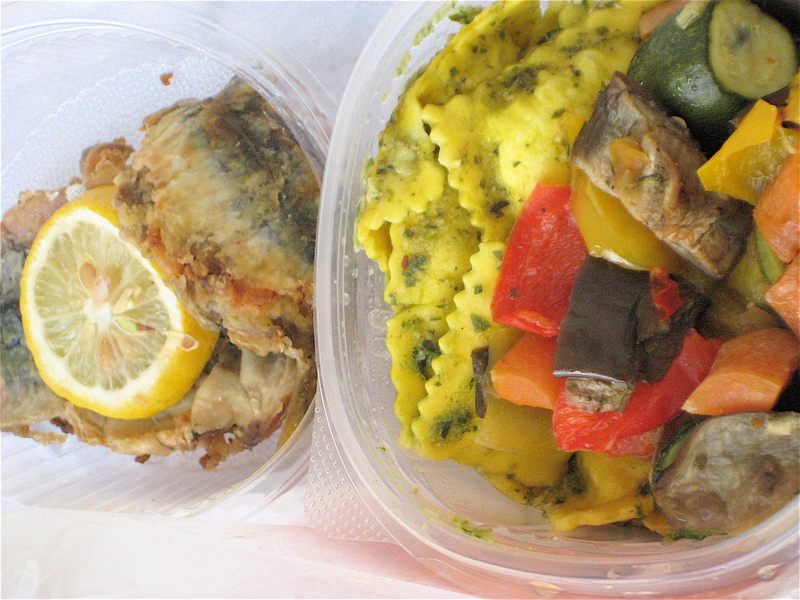 ), and some fresh ricotta ravioli with pesto (no carb left behind…), which the food stall staff packed up for us in a little container to go. B also picked up some fried fish and bread. We were then mesmerized by this beautiful salumerie stall by the exit, where we asked the salumerie man to pack us a sampling of his favorite meats, and somehow resisted eating our food for the next twenty minutes while we walked over to the Pitti Palace, the original home of Florentine banker Luca Pitti, which later became the Medici family’s “treasure house” and living quarters. It had a large, foreboding, fort-like presence that was undoubtedly meant to intimidate commoners and let them know just who had more money, as if that wasn’t obvious enough. 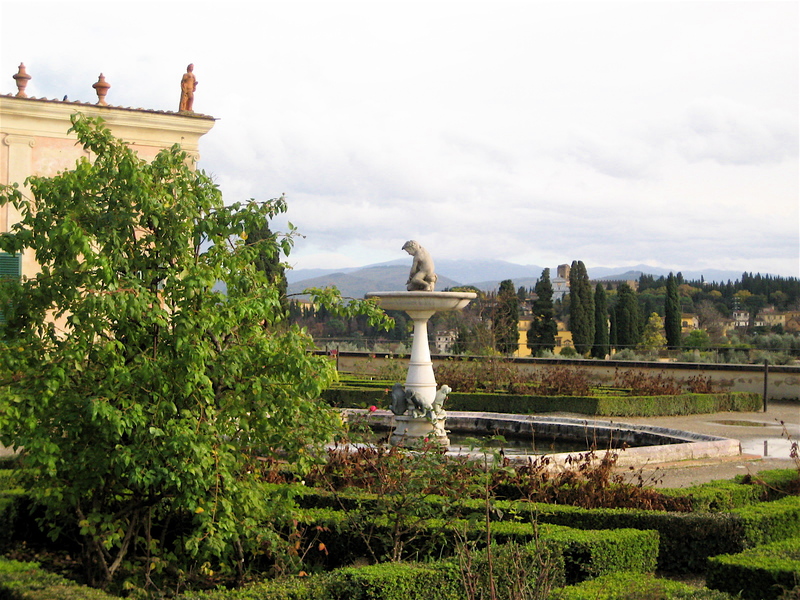 The impenetrable exterior was protecting the most beautiful palace grounds and gardens, with a spectacular view of Florence. This was where B and I wanted to eat our picnic lunch, where the Medicis once ate theirs. We walked up to the highest point in the Boboli gardens and sat down on a bench in a smaller, enclosed garden. 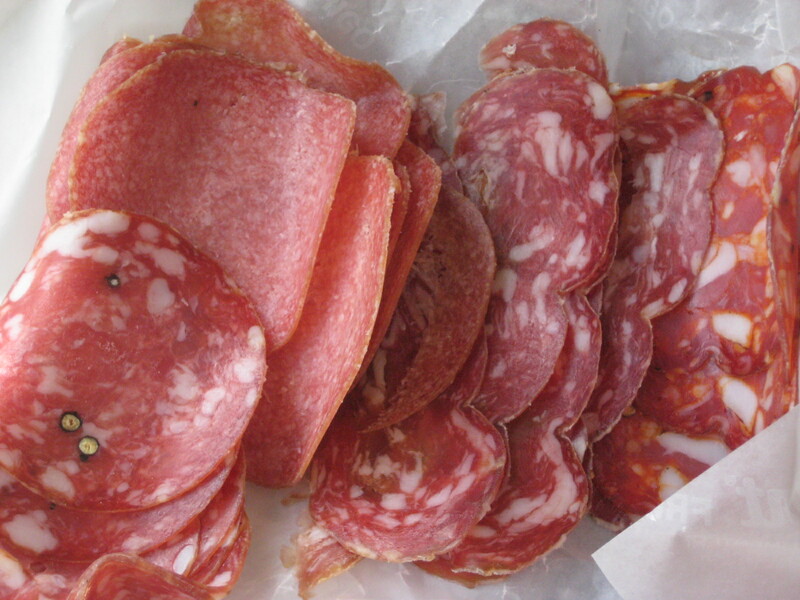 The salumerie man definitely knew what he was doing, he gave us the classics– different types of regional salami as well as some refreshing spicy salumi. 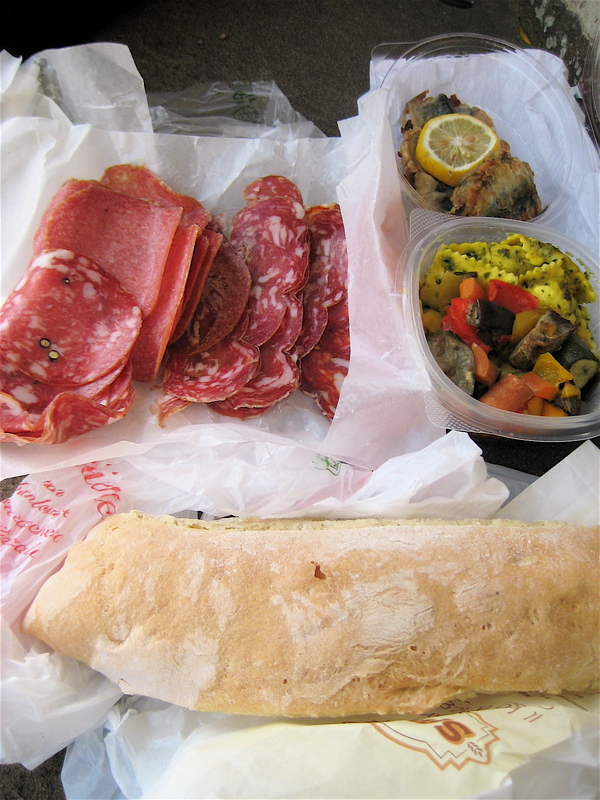 We made salumi sandwiches and also had some of the ravioli and veggies. It was a perfect traditional lunch in the privacy of the most beautiful palace in Florence. I’m sure the Medicis had an entourage of butlers, maids, and chefs, and a spread of the most exotic foods, but we were perfectly content sitting on a bench with our small plastic containers of fresh, local food, in our very own Florentine garden.